IndianCupid -There for Marriage Minded "Non Resident Indians"
This website sets out with the aim of helping romantically-minded Indian people. It comes by way of playing cupid. I was chatting with an Indian friend of mine the other day. And she says “for Indian people it’s still family that plays the main role in marriage”. Family are the ones who help to find the right marriage partner. They are there for the young family members. This help is there just when they are coming to marriage age. What I found right away on going to IndianCupid is that there’s a good many casual daters there. So what can IndianCupid give to Indian people that they can’t already get from their friends and family? Is there much of a need for “do it yourself” marriage Indian style? Well, I set out onto their website with the aim of finding out. At cupidsviews, we always like to get the views of real users. So I went over there and struck up conversations with a few of my fellow daters. My first experiences on IndianCupid were interesting. Now I’ve tried other sites such as Shaadi.com which are much much bigger. But what I found right away on going to IndianCupid is that there’s a good many casual daters there. People looking to meet and start courting quickly. Without much fuss about a real relationship down the road. That surprised me a bit. As I was told it’s for men and women who want marriage. Now on second thoughts. 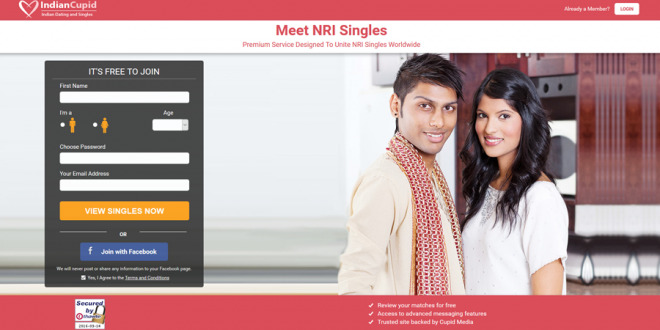 When I asked a few people about this, I was told it is aimed mostly at what they call NRIs. Or “Non Resident Indians”. See our survey for the exact breakdown. So the website is all in English. And it isn’t exactly made for non-Westernized Indians. Others like Shaadi are more cultural. IndianCupid is set out much like the other sites that we’ve look at here at cupidsviews. Everything is at hand and it’s quite quick and easy to get started. The only difference is the join page. On there there’s some extra choices. These include items like religious view, exact ethnic origin, your parent’s jobs and so on. Oh and you can also create the profile for someone else. Like a sibling. Or a father for son, or daughter for example. If you do it yourself I would say get started on your personal profile right away. Doing that, you’ll be ready when people click on “you”. Too many people forget this. But dating sites routinely promote new users. On “new members” pages and in emails. So when people visit your personal page, you want them to see something. The mixed cultures ● You can find beautiful Indian women in traditional outfits. And young women and men in jeans and t-shirts. So it’s a very mixed group. This means there’s someone for all tastes. As I said, the website is very much aimed at Indians with a Westernized outlook. So I think it creates a good alternative to Shaadi or BharatMatrimony. These may be way too traditional for Indians living in the U.S. or United Kingdom. Some people I met even said they found these places boring! How serious are you? ● You’ll need to decide which membership plan suits too. With the lowest, the trial, you can get started for free with your very own page and scooting around. But you have to wait to be contacted. That’s the disadvantage. Go up one level and that’s lifted. Only then can send out messages to anyone. Cupid searches ● With the help of a little technology, IndianCupid can connect you with someone who’s of the same background and values as you. Their search system does work but it takes some practice to get the most out of it. The tools the website gives you are enough to help you find and talk with anyone of your choice. But the rest is up to you. When I first went to IndianCupid, I had the feeling it would be a “Shaadi like” website. What I found was something totally different. This is a little, niche website. It’s aimed at Indians living around the world. Mostly those who’re living in the West. Not in India. It’s not a traditional or culturally purposed site at all. The main hitch I found on there was getting matches in my area. Because it is so small, IndianCupid doesn’t always throw-up matches where you want them. I found people, but they lived the other side of the country. Or I’d chat with someone and find they lived in Canada or someplace. That’s why I gave this site a lower score than some of the others we’ve tried out on cupidsviews. So this site does give a good choice for those wanting marriage. IndianCupid is for the younger, more contemporary Indian. That’s in my view. seriously seeking a single female/ woman for marry and bring her to Papua new Guinea, she can live here work for good monies, and even make our own business because PNG is the place to make business and become millionaire. I have joined indian cupid and browsed the site.To be totally honest I think this site is meant for indians only.If you are not a Indian you get almost zero interactions with them.I have contacted quite a few women on indian cupid with almost no response. Please be honest with this site and discourage any and all ethnicitys except indians. Summary : For marriage minded Indians living in other parts of the world outside of their homeland. IndianCupid is small but sweet. That's what makes it difficult to get decent matches.